Condition: We are pleased to offer this pair of unusual figures for sale. 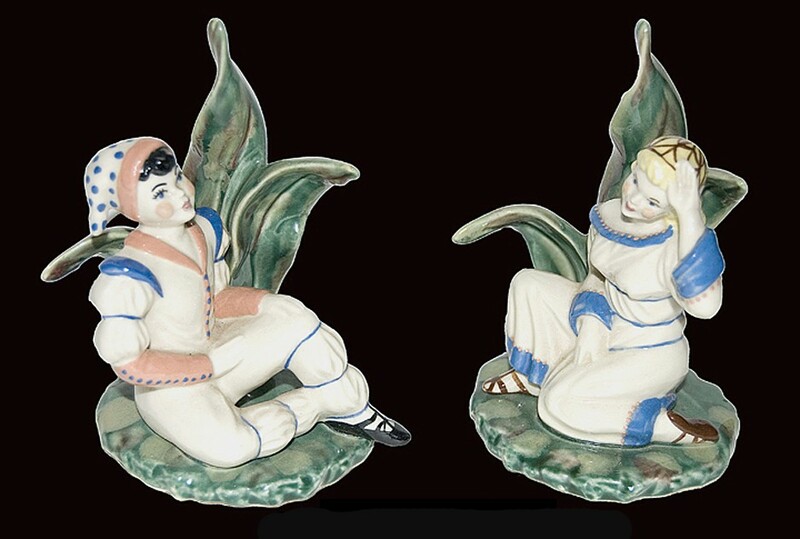 Peter Pan and Wendy were produced by Ceramic Arts Studio. 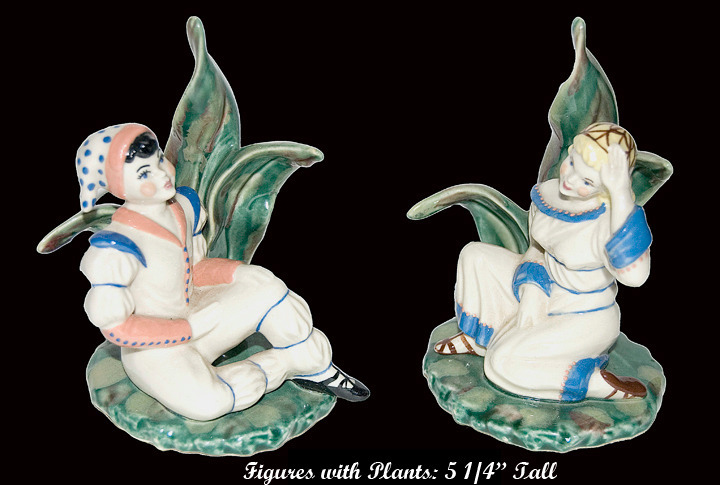 This out-standing pair of whimsical figures is in Undamaged Condition without chips, cracks, or mold damage. The hand painting is stunning and the workmanship is top quality. You will not find a nicer pair of figures to add to your collection. These figures are not marked but they are shown in the Ceramics Arts Books. US POSTAGE AND INSURANCE ON THIS PRETTY SET IS CALCULATED. PLEASE SEE THE SHIPPING TAB FOR MORE INFORMATION. The Ceramic Arts Studio was established in 1941 by Lawrence Rabbitt (an art major), and Rueben Sand (who was in charge of financing and sales). The Ceramic Arts Studio became famous in the 1940s for its production of cast art and hand made ceramic figurines and knickknacks. These hand painted and sometimes ornately decorated pieces are avidly sought out by collectors. Quite by accident the two young men stumbled into Betty Harington who became their major designer. Betty had hired Sand to fire a piece that she had designed at home. Betty had no experience with pottery making, but design came easily to her. The Ceramics Arts Studio was definitely on the way to becoming a contender in the pottery market. By 1943 many workers were hired to keep up with the demand for the pretty little figures. Marshall Fields purchased some of the Ceramic Arts figures and found that they sold well. They became one of Ceramic Arts biggest retailers. The Ceramic Arts Studios began attending gift shows and found that their figures charmed the buyers. Ceramic Arts figures were sold across the United States, Canada, and even overseas. Ceramic Arts Figures are usually marked with one of eight different Ceramic Arts Backstamps, but early pieces sometimes were sold with only a paper label. These wonderful figurines have distinctive glazes and features, so it is easy to learn to tell a Ceramic Arts figure from others that were sold during this time period. In 1955 the company ceased production, and the owner of the company moved to Japan where he continued to produce the figurines for a short period of time. Shortly after the move new molds and pieces were introduced, and the old style figures were no longer made.